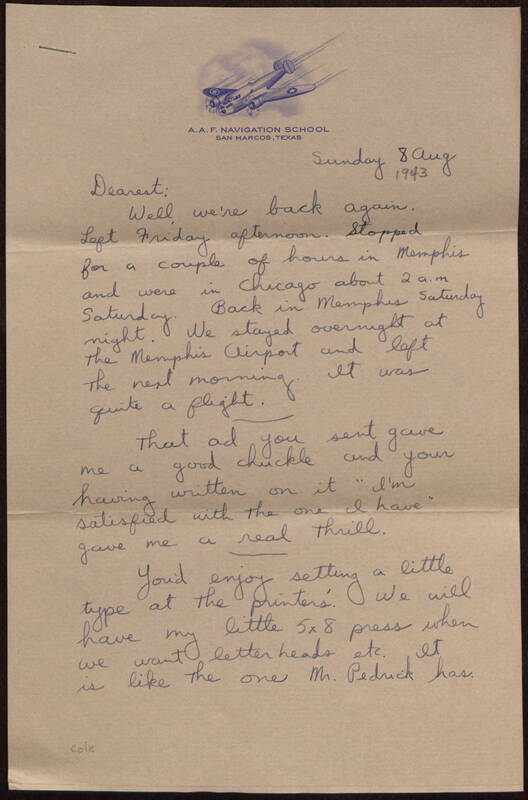 Sunday 8 Aug 1943 Dearest: Well, we're back again. Left Friday afternoon. Stopped for a couple of hours in Memphis and were in Chicago about 2 a.m Saturday. Back in Memphis Saturday night. We stayed overnight at the Memphis Airport and left the next morning. It was quite a flight. That ad you sent gave me a good chuckle and your having written on it "I'm satisfied with the one I have" gave me a real thrill. You'd enjoy setting a little type at the printer's. We will have my little 5 x 8 press when we want letter heads etc. It is like the one Mr. Pedrick has.